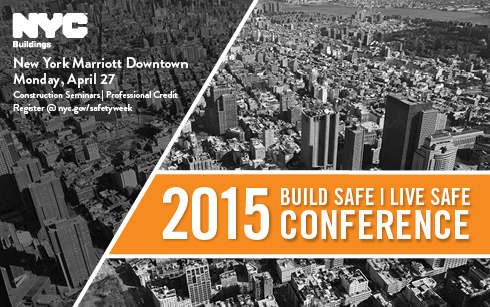 Construction Safety Week 2015 launches on Monday, April 27 with our annual Build Safe │ Live Safe Conference! Tickets are still available for this daylong series of seminars. Department experts will discuss industry trends and highlight safe construction operations. Professional credit will be available. Façade projects requiring site safety plans – buildings 15 stories and higher – may now use a site safety manager, rigger, designated rigging foreman or qualified person to oversee site safety. See NYC Building Code §§3310, 3314.4 and 3316.9, and 1 RCNY 3310-01. The filing period for Façade Inspection Safety Program (FISP) Cycle 8 began February 21, 2015. Technical Reports filed under Cycle 8 must meet new submission requirements. The Department of Buildings is serving on Mayor Bill de Blasio's Tenant Harassment Prevention Task Force, which will protect New Yorkers from unlawful construction tactics that displace residents from rent-regulated apartments.